We are very proud to have been nominated and won recently the Buildhealth NI Sub-Contractors Award. We were nominated for the award by Lagan Ferrovial Costain JV for our efforts in promoting health awareness in the Company. The awards ceremony was held recently at CAFRE’s Greenmount Campus and the award was presented by Keith Morrison, Chief executive of HSE NI. 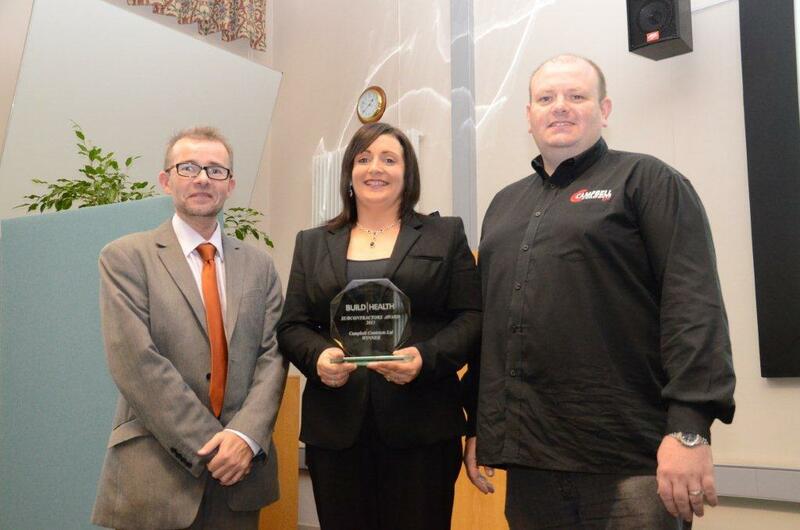 “At the recent BuildHealth “Hidden Killers” seminar held at Greenmount College, Antrim on Wednesday 16th October, Campbell Contracts Ltd won the 2013 BuildHealth Subcontractor award for their implementation of best practice in the management of occupational health risks on a construction site. The BuildHealth initiative is a joint venture between the construction industry in Northern Ireland and HSENI, and has been running since 2007 (see http://buildhealthni.com ) The BuildHealth Subcontractors’ Award recognise exemplary practice in the management of occupational health risks by subcontractors amongst their employees. The Lagan Ferrovial Costain A8 Team, in their role as a BuildHealth Champion site nominated Campbell Contracts Ltd and Coating Developments (2005) Ltd for the 2013 awards. Campbell Contracts Ltd were the overall winner of this years competition for their work in Health management to the A8 project. The judging panel praised Campbell Contracts Ltd for their level of understanding of the health risks and statutory requirements placed upon them in particular the evidence of integration of occupational health risk management into the subcontractor’s systems of work and their close relationship with a local GP practice to provide them with specialist occupational health guidance in relation to both health and medical surveillance.